Read current news from both Lemont Scrap Processing and the Scrap Processing Industry. 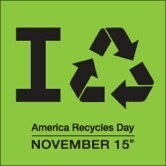 November 15th is known as America recycles day. If you don’t already recycle this day is a good time to start. Click on the logo below to learn how you can take part in this important day. Member of the Institute of Scrap Recycling Industries, Inc.